Speaking of projects, I would like to make big floor pillows for Emma and Mary. I’m looking for advice, recommendations on fabric. I think that wool felt or fleece will get "pill-y", but I like the softness of them. Any ideas, advice would be appreciated. Well, I sat down at the computer meaning to balance my checkbook and pay bills. I thought a diet coke and a good CD would ease the pain of the task at hand. Dan was laid off again this week. It has been touch and go, since I last wrote about him being laid off. He got more work, but was laid off again on Monday because there are no carpentry jobs right now with this company…just in time for Christmas. Obviously, Mary has other plans for my time right now…she’s calling to me from her crib. Guess I’ll just have to set the old checkbook aside for now…. We made salt dough ornaments too, I’m in the process of painting them now. Sorry about your hubbys job problems, my heart goes out to you. 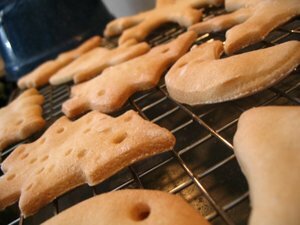 I’m making some salt dough gingerbread men for the xmas tree. Didn’t feel like breaking out the glass ornaments this year. I’m sorry to hear about your husband’s job. I’ll keep your family in my prayers. Why is it at Christmas there are so many bills and everything breaks needing $$ to fix? Maybe you could use denim or my favourite corduroy which is nice and soft. Denim does get soft after a few washes. It is good to put in a zip or velcro so you could wash the covers. Dark colours so they hide the marks! I’m so sorry to hear about dan, I will pray some work comes up that will more than cover your needs. Too bad you aren’t in FLorida! There is such a shortage of good contractors down there. I bet maybe your home town is like that too since I heard the east coast is booming in real estate too. I still look up to what a great mom you are. When I’m out of this child bearing phase I hope that I can have all these great activities planned for my kids. I have a question, do you do the whole “no toy” thing. I have heard of it lately and Owen totally couldn’t do it. When I think of anyone I know that could I think of you because you always have such great activities planned. I’m really not considering it, but was just curiuos. For the floor pillow, what about using a canvas (I’ve found some types at fabric stores that are quite nice after pre-washing), corduroy, or maybe even an old wool blanket. If you want the feel of wool felt, maybe applique something on them? I’m not sure if you get Martha Stewart but a few months ago there was a spread of tings made out of old jeans-and they actually looked really cool! They made fabric by cutting strips and sewing them together or using a patchwork motif. I think they could turn out cheesey-but if you did it in a certain way-it could be really cute, durable, and cheap! I will try to find what month that was in and maybe scan some photos into my flickr stream if you want. I will be trying to send good vibes your fam’s way-remember that we are never given more burdens than we can handle-it will get better soon!